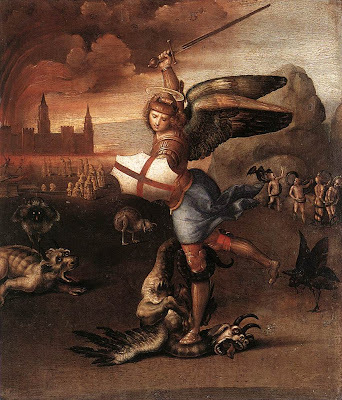 On September 29 the Catholic Church honours the Archangels Gabriel, Michael and Raphael in the new calendar, and the traditional calendar honours St Michael (Michaelmas Day). Saint Michael, being the patron of paramedics, holds a special place in my prayer intentions. Click on any picture to enlarge it for more detail. Saint Michael is given by the Church the highest place among the angels, for she refers to him as the "Prince of the heavenly hosts." 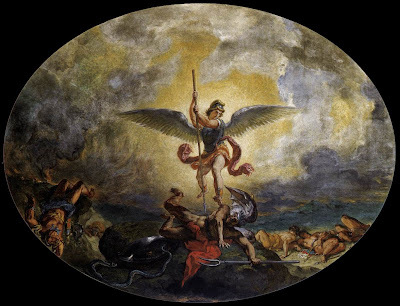 Here Saint Michael leads the angels in their heavenly battle against Lucifer and his legions of disobedient angels when Lucifer's pride caused him to rebel against God and seek His throne. St. Michael answered the call of the rebel angels with his warrior's cry of fidelity to God, "Who is like unto God? I believe and I adore." The devil shudders with terror every time we call upon the name of this triumphant heavenly marshal. 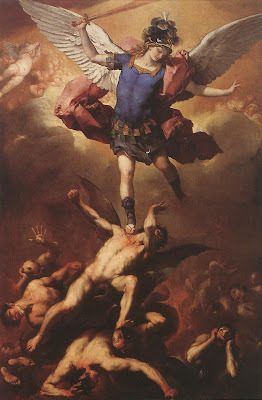 Saint Michael never ceases to wage war against the devil. He has been honoured since the earliest times, and the Church recognizes the exalted power and dignity that God has bestowed on this heavenly warrior, the dragon-slayer; the defender of Christians; the helper of the dying; the champion of the Church. Almighty and Everlasting God, Who by a prodigy of goodness and a merciful desire for the salvation of all men, hast appointed the most glorious Archangel Saint Michael as Prince of Thy Church, make us worthy, we beseech Thee, to be delivered by his powerful protection from all our enemies, that none of them may harass us at the hour of our death, but that we may be conducted by him into the august presence of Thy Divine Majesty. 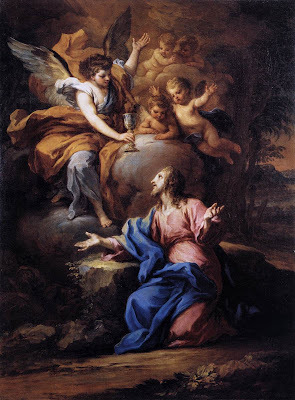 This we beg through the merits of Jesus Christ, Our Lord. Amen. 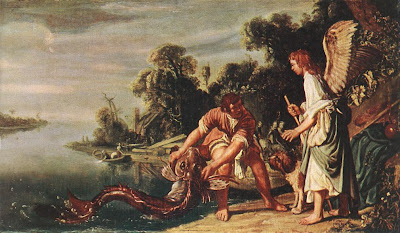 Here, Raphael appears to Tobias, with the salutation, "Joy be to thee always." The name Raphael signifies "Medicine of God," and indeed St. Raphael appears to be at the head of the angelic medical staff! 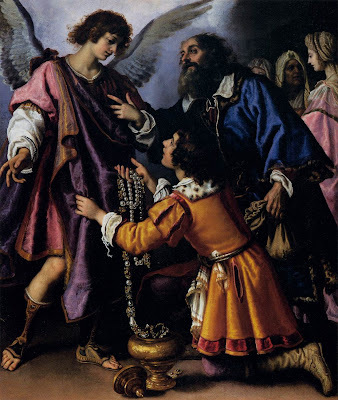 Tobias and his father offer half of their new-found wealth to Saint Raphael, as a thank you to him. 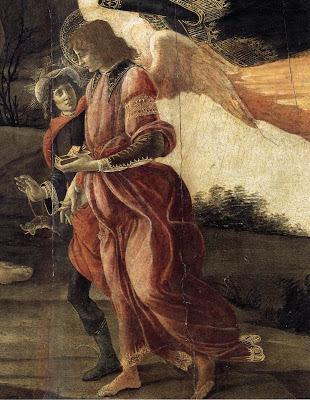 Raphael refuses and reveals his angelic identity, telling them both to instead give thanks to God in heaven. Tobias 12:6-15"Bless ye the God of heaven, give glory to him in the sight of all that live, because he hath shewn his mercy to you...When thou didst pray with tears, and didst bury the dead, and didst leave thy dinner, and hide the dead by day in thy house, and bury them by night, I offered thy prayer to the Lord. And because thou wast acceptable to God, it was necessary that temptation should prove thee. And now the Lord hath sent me to heal thee, and to deliver Sara thy son's wife from the devil. 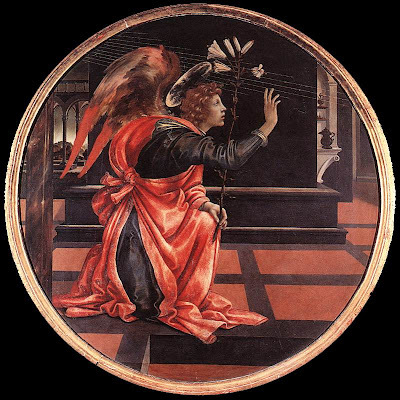 For I am the angel Raphael, one of the seven, who stand before the Lord. 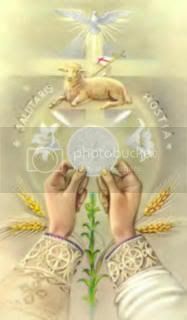 O Saint Raphael, Medicine of God, Angel of happy meetings, of peace and of joy, we beseech thee, cure our infirmities of soul and body in virtue of the Divine Blood, source of all healing graces. 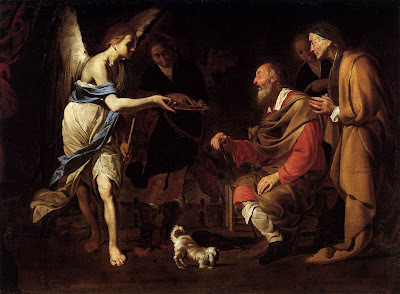 Gabriel, the "Strength of God," as his name means, is God's ambassador. His greatest mission was to announce the Incarnation and God's mighty work of the Redemption. Here, Saint Gabriel kneels and speaks those timeless words which will be echoed for all eternity, "Hail, full of grace." 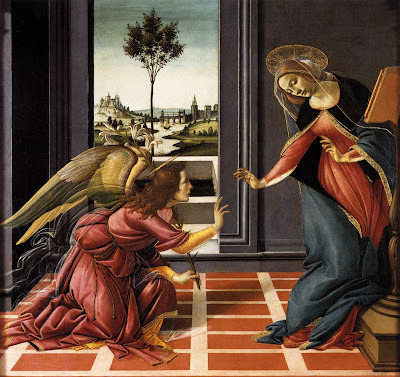 Notice the humility that Mary displays at the presence of the Archangel Gabriel. 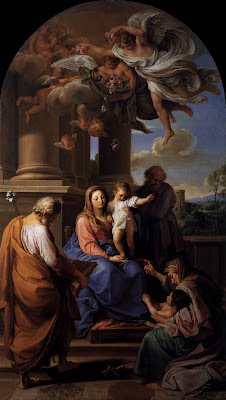 Yet, notice too, how Gabriel is crouched before Mary in his own act of humility as he absorbs the sanctity and dignity of this most holy and humble Virgin whom God has chosen to be the Mother of Jesus. Gabriel's announcement of the birth of Jesus echoes through the hills of Bethlehem as all of heaven resounds with the glorious hymn, "Glory to God in the highest, and peace on earth among men of good will." 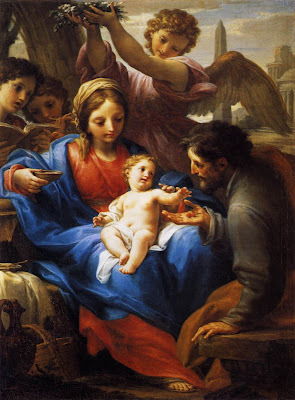 Gabriel, on another of his heavenly assignments, accompanies the Holy Family on their flight into Egypt. 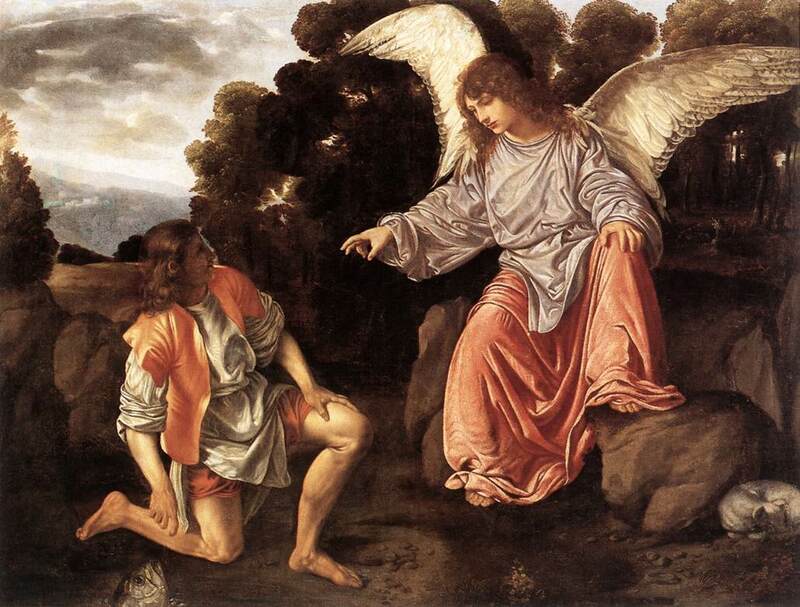 Gabriel is the angel who comforted Our Lord in His agony in the garden. Jesus invited Peter, James and John into the garden to pray and watch with Him, but they slept, leaving Jesus to the comfort of an angel. 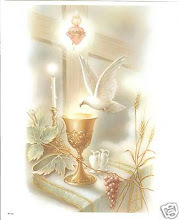 Saint Gabriel strengthened Jesus, comforting Him with hope, peace, reverence and sympathy, giving him a heavenly chalice to drink from. What a wonderful post. Thank you so much for your research and the wonderful images. I love this post, one doesn't hear much about Raphael so it is nice to read about him. He would probably be a good one for you in your job.